You’ve heard the lady! 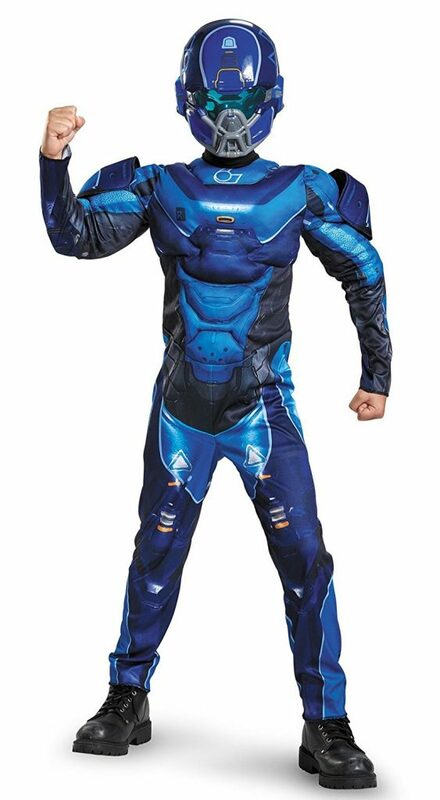 Move like you’ve got a purpose and choose your suit like it’s the last Halloween on Earth! Witches, vampires, six Harley Quins on the square meter – all of these will be seen during the upcoming event, known as Halloween, the feast of the undead (and little children begging for candies, of course). For you this could be a great opportunity to once again become a part of your favorite legendary universe, to feel as a super soldier in the thick of things. 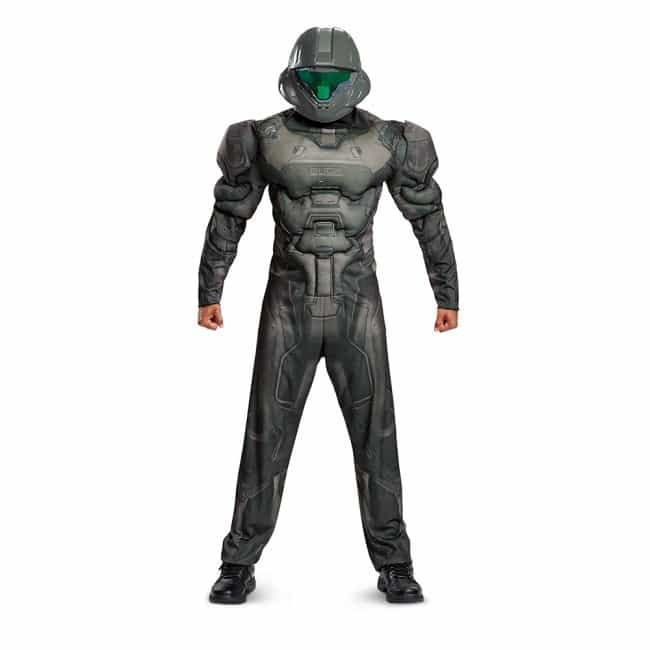 Halloween is near, Halo Spartans. And that means we have to equip ourselves, as well as our children to get through this event. Having some problems with choosing a proper suit, or are still uncertain that a cool one can be bought? Well, don’t worry, this article is brought to you in order to give some help to those who are still choosing their appearance, where to buy, or what to buy. We hope that after reading this one, you will be able to deal with this decision. 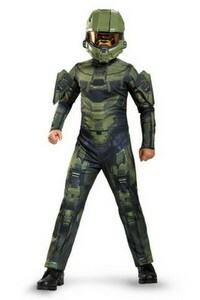 Starting with probably the coolest one among Halo boys costume. This one’s main feature is an included voice changer with a microphone! Your children will surely be excited and thankful for this one. At least, we would’ve been. Considering the fact that this product was designed for children, it won’t include some of the additional body parts, which are owned by his “elder” version. The suit is being manufactured in various sizes, as well as the gloves. An exception from that rule will be the helmet – it always comes in the same size, but it will suit 99% of children. This fact is achieved because the headgear includes only front half of the helmet, being fixated with elastic. The costume by itself looks realistic, in terms of body shape, it looks rather natural. The print on the suit is done great, every detail can be seen and recognized. 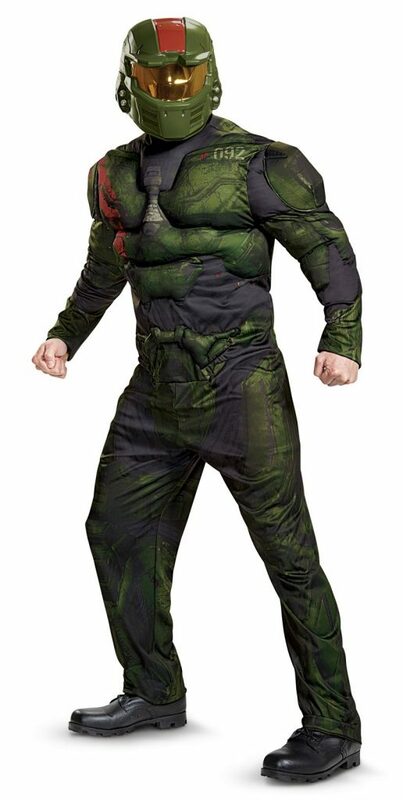 And the costume also benefits from additional insertions on the body and shoulders. The helmet is not full or vacuum-designed, which can break already mentioned appearance from the back. 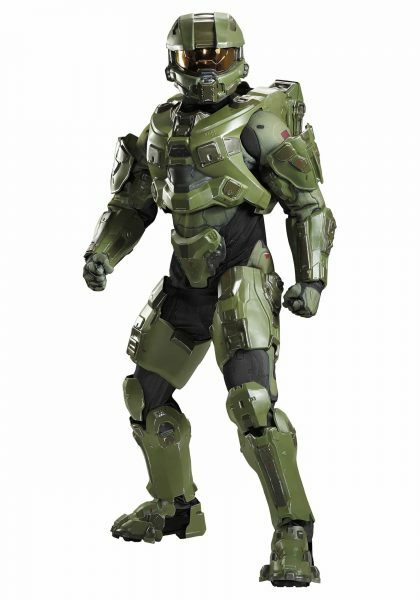 If you think that Halo Master Chief’s suit could be some kind of narrow-focused mainstream, or you simply dislike the colors or a bit militaristic appearance, then you may like Halo Spartan costume. In Halo’s lore, Spartans were a part of military program, whose goal was to create genetically modified super soldiers. Basically, Spartans are elite parts of human army. This suit’s appearance is much more cartoon-like than the previous one’s. 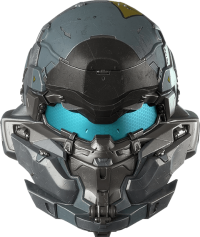 Due to that, this suit can be considered, used and worn apart of HALO universe and seems rather neutral. That makes it more flexible in terms of different events your child can take part in. 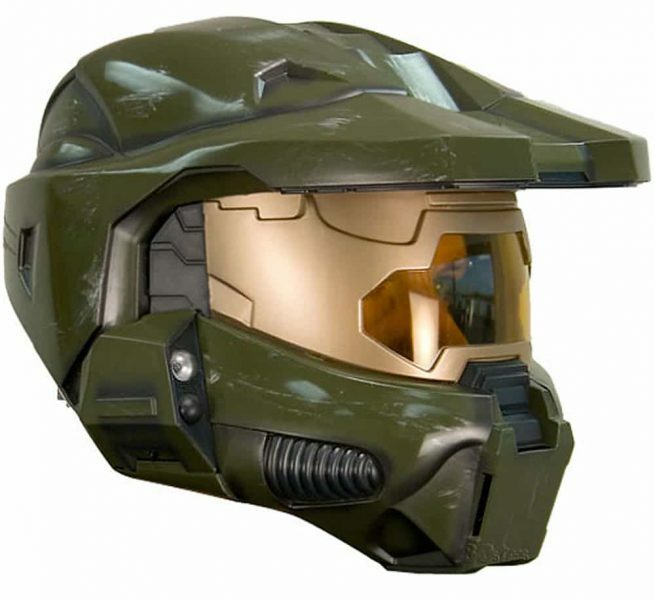 This model has also got different helmets design, although it is still made to be a half Halo mask. You’ve read it right – helmets. 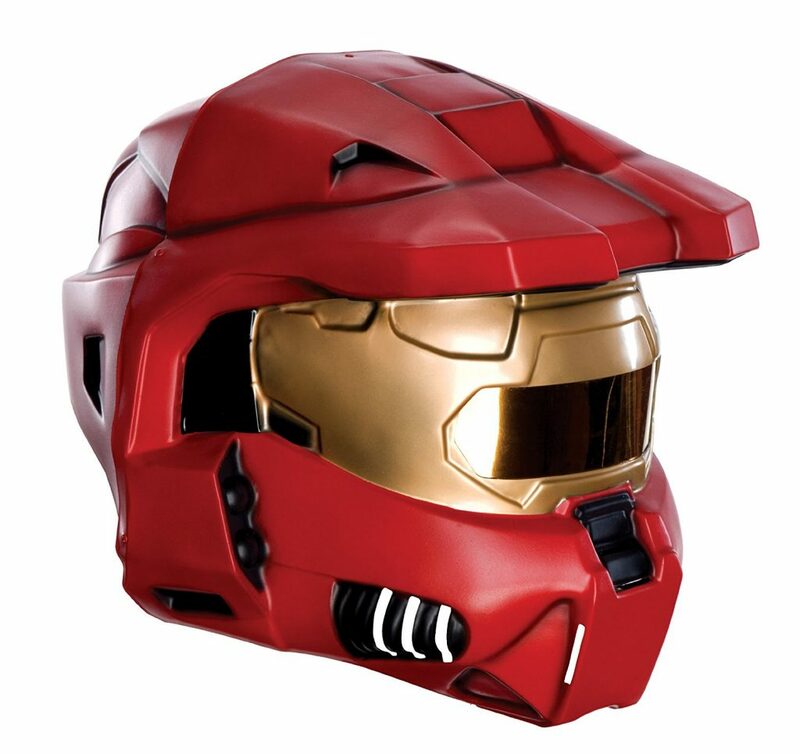 With this suit, you will be able to choose among two different helmets to your taste. The additional difference is that this model seems to highlight the fake “muscles” more than a previous one. If you will look at the different pictures you will see that because of the colors and different print design, body shape becomes more recognizable. Red team consists of around 20 Spartan units, which actively participated in several major battles of HALO universe. The important thing to mention is the fact that they did not always serve together. On August 23, 2552, Red Team took part in rescuing operation on a planet of Reach. In a week, by August 30 they were assigned as a part of Red Flag operation with UNSC Pillar of Autumn. But before the operation barely started with “Autumn” exiting the system, every other UNSC ship was called back in order to defend Reach from the invasion. Red Team was deployed to the surface in order to defend power supply generators, connected to the planetary orbital defense platform. Even though they managed to deal heavy damage to covenant forces, many Red Team members died during the operations. Both these and the following. Now back to the article topic. Basically, this model is similar to previous product, except color. But one more thing is that in this particular model, the dark parts of print seems to be of lower quality. That is, of course, an illusion. But it’s created exactly because of the main color and its contrast. Comparing this one with his “younger brother”, we can see a lot of tiny (and not that tiny) changes in body design. This model seems obviously bigger and more massive, although it’s more square-like. While additional muscles on shoulders will make the whole shape look better, chest protrudes a bit – and this will create this already mentioned square appearance. 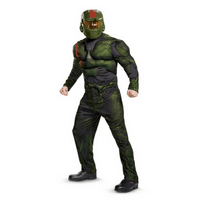 The other thing worth mentioning is that from far this costume can look like standard military camouflage. That’s not a pro, nor a con by itself. But we guess it can deliver some additional ways and ideas of usage for those who will seek for it. 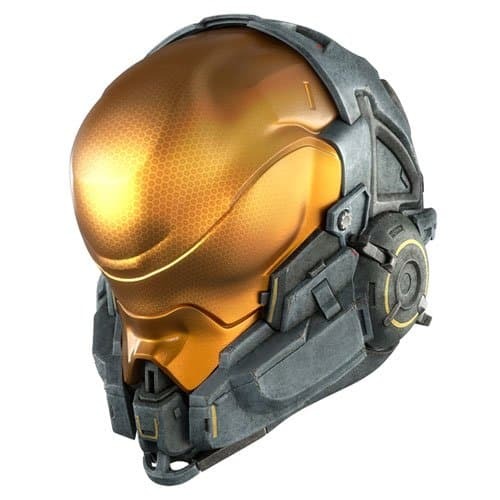 The helmet is already full and looks rather realistic, still quite convenient and easy to wear. The visor is also equipped with reflector, which will only increase the impact. 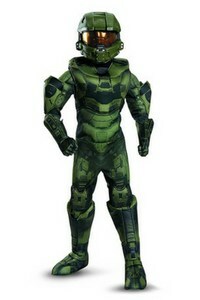 The Full body armor version of Master Chief Costume. 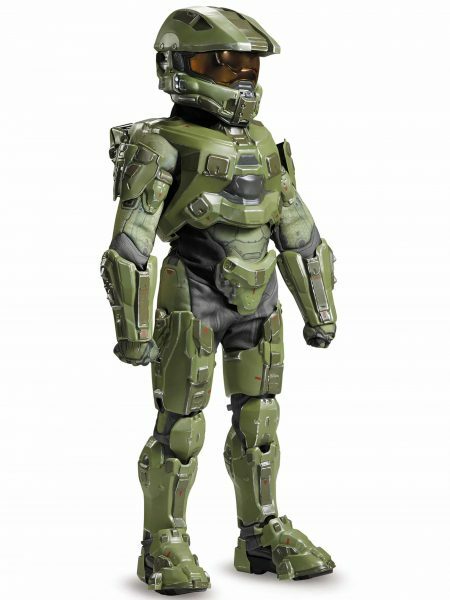 This is the the best Master Chief Costume you can get currently. 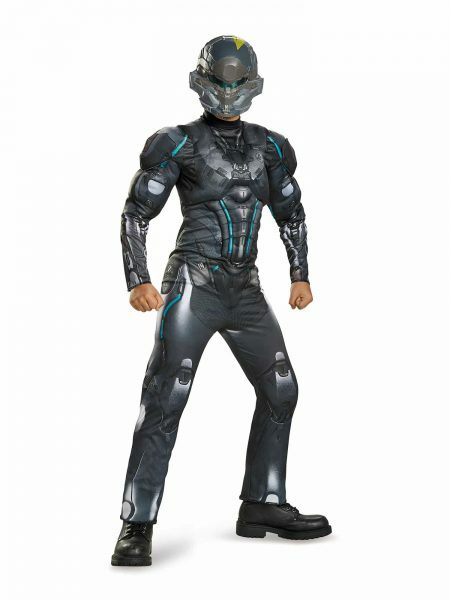 It Comes with high quality armor and design. 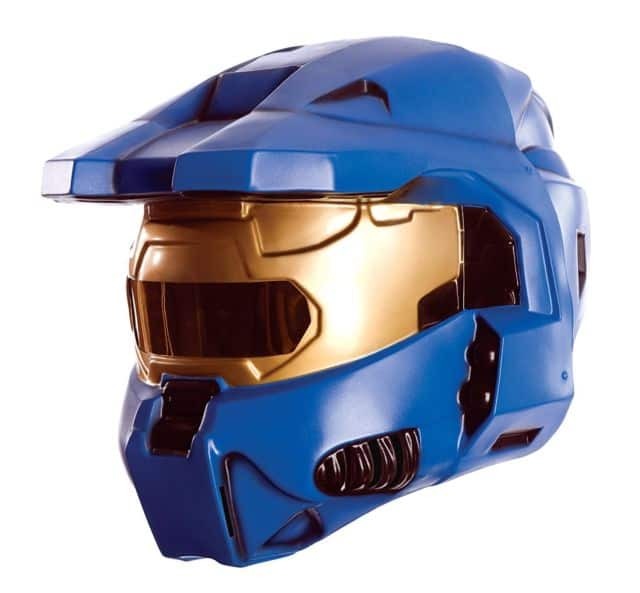 A real Master Chief Helmet power with 2 Led which make it stand out during the Halloween night. 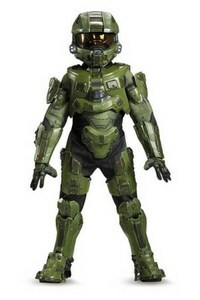 Full Armor Master Chief Costume from Rubies Edition. This is a collector edition. There is only 2 left from manufacturer. I would personally choose the one above than this due to its color accuracy and qualities. If you are planning to repaint the armor then it would’t be a problem. Stylish black suit. We think that this one suits Halloween perfectly aside from HALO side of the question. It seems rather dark, more high-tech, muscular and appropriate for the night of the living dead. 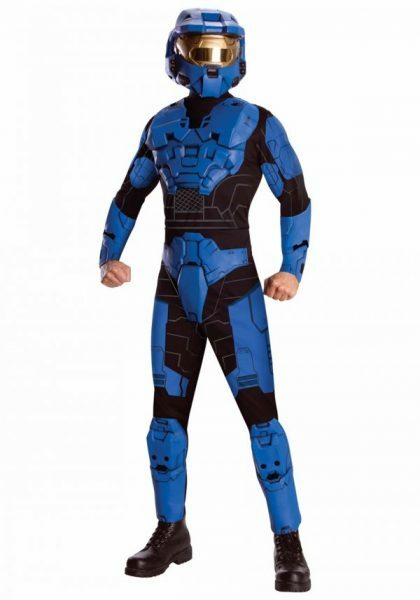 The print on this product is quite different, comparing to Chief’s suit or even other Spartans’. And this fact provides the suit with some of his own, unique visual features. First off, the body shape mentioned already through the review for several times is implemented here in the best possible way. The shoulders are more compact and not that disturbing, muscles on the arms look great and the muscles on the press make the suit’s owner look very fit. 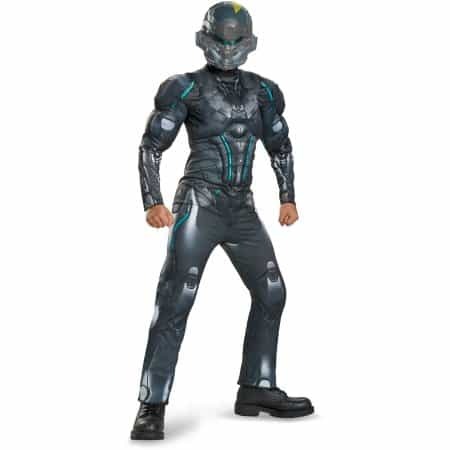 As well as with every other product, this suit has its own unique helmet design. Although we are not meant to discuss our personal preferences in this article, we love it. The back of the suit was designed to be high tech, but it contrasts with the front so much, that the whole print on the back side will not look that well. 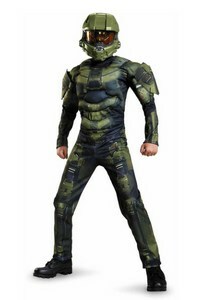 If you think that Master Chief cosplay could be some kind of narrow-focused mainstream, or you simply dislike the colors or a bit militaristic appearance, then you may like Spartan suits. In Halo’s lore, Spartans were a part of military program, whose goal was to create genetically modified super soldiers. Basically, Spartans are elite parts of human army. 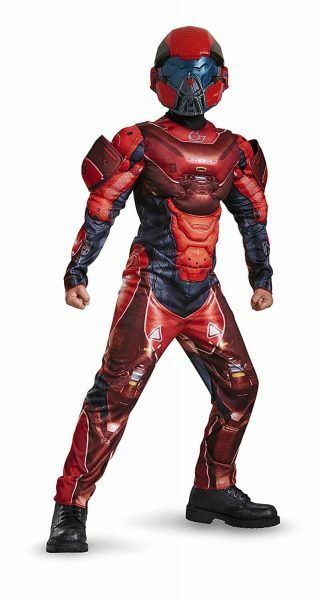 This suit’s appearance is much more game-like than the previous one’s. That can make it more flexible in terms of different events you can take part in. 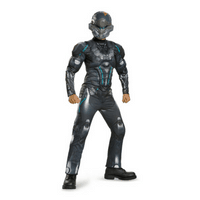 Unlike his own variation for children, this suit has a full helmet, also more circle-like. 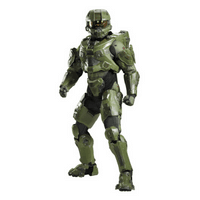 The additional feature is that this model seems to highlight the fake “muscles” more than, for example, Master Chief’s suit. If you will look at the different pictures you will see that because of the colors and different print design, body shape becomes more recognizable. 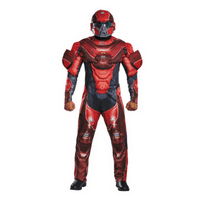 This is another Red Spartan Costume from Rubies Collection. The Extra Armor are made up of Styrofoam material. 70% of the buyer complain that the size is bigger than it is. Make sure you choose a smaller size when you buy. Spartan’s Blue Team was a combat sub-unit under SPARTAN-II Division of the Naval Special Warfare Command. This sub-unit consisted of four members, led by John-117 during the Human-Covenant war. However, after John disappeared at New Mombasa, Frederic-104 took a role of the leader. The team also absorbed personnel of SPARTAN-III during the Battle of Onyx. Even though the leader role was stable on this team for the most of its existence, its roster changed frequently for different operations and missions, which changed both members and size. The team was once again reformed during the Battle of Earth from the surviving Spartans. The suit looks pretty much alike previous one, except colors. These look brighter and not military at all. 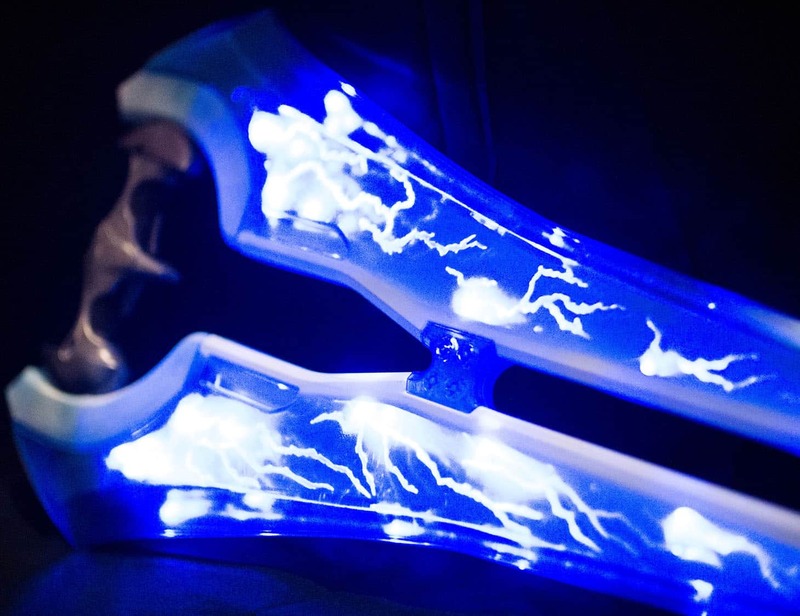 The Blue Warrior from Rubies Version. The question doesn’t concern subjective preferences, it is more about possible re-sellers. 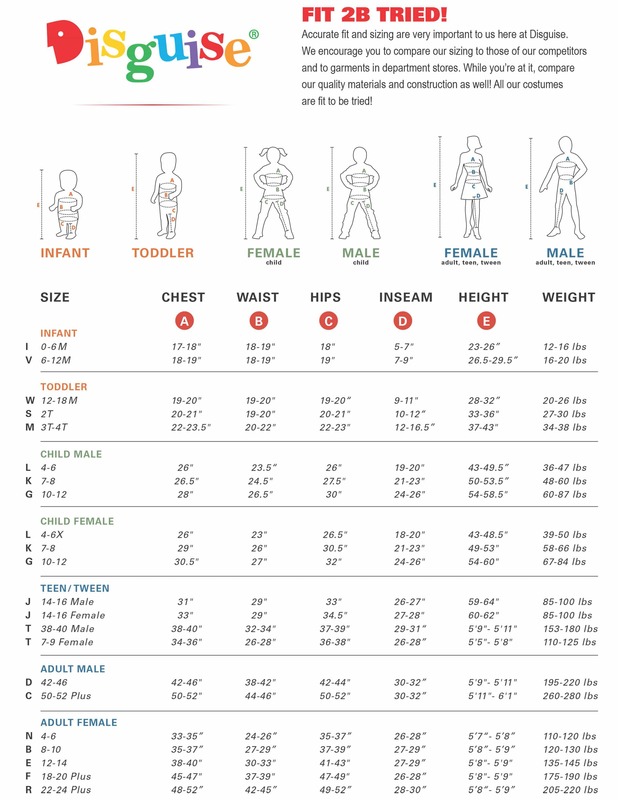 Check the sizes. Since you won’t be able to try the suit on before it arrives, the best option is to contact the seller and ask him for his line of sizes. After such a check, you will be sure that the product will suit you perfectly. Remember that the shipment will also take some time, so don’t wait until the deadline hits you. 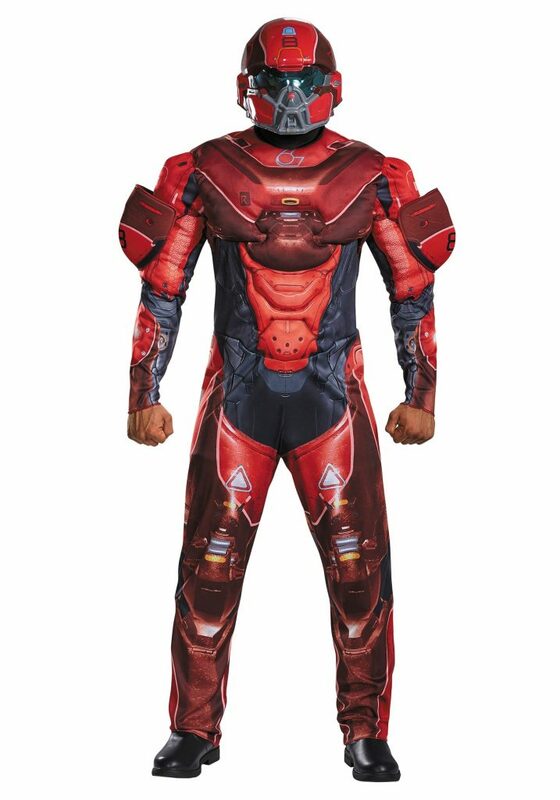 Is there any additional list of items I will have to buy before using this suits? It is advised to use balaclava under the helmet. Also, make sure your underwear is comfortable enough to wear it under a full suit for several hours straight. Are shoes included in this pack? 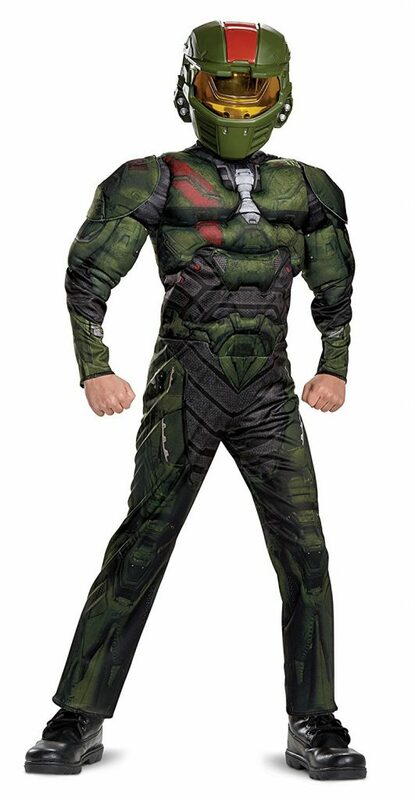 How durable is this suit? The durability of the suit will depend on the way you use it and the way you treat it. 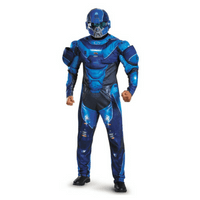 As it was already mentioned, muscle suits require hand wash. Also, they are not designed for long physical activity. And remember that the helmet may be more fragile than you think since it is made of plastic. Halloween is not the only proper event for these products. 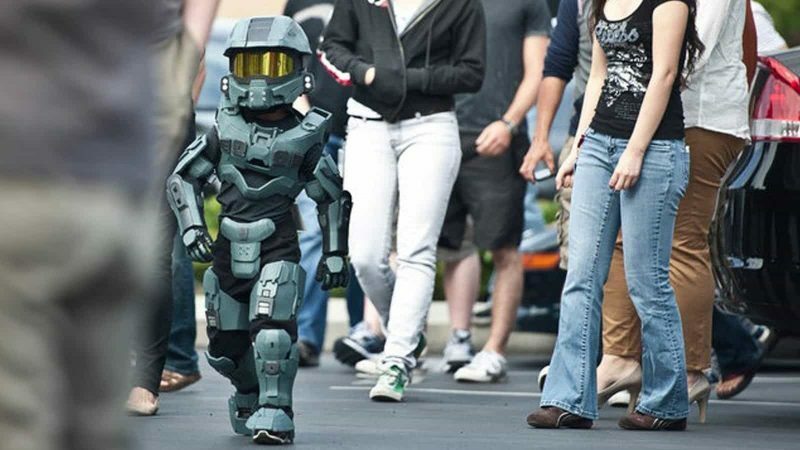 You will also find it useful during local Halo cosplay events with the theme of video games, geek events and even during playing with your children if you have ones. Actually, the area of usage is only limited by your imagination, and we’re sure you’ll figure out more ways by yourself. To sum up, we wish to bring you our own opinion and choice. Consider the following to be some kind of editor’s choice. We were able to highlight three different categories – best choice for adults, children and kids with their parent. First category winner is a Locke suit since we like it the most from the visual side. 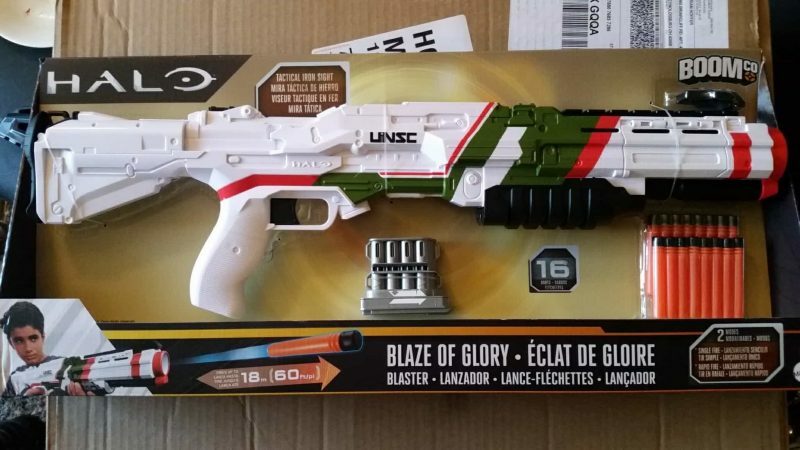 In addition, it is rather stylish and, if needed, can be used outside HALO lore. 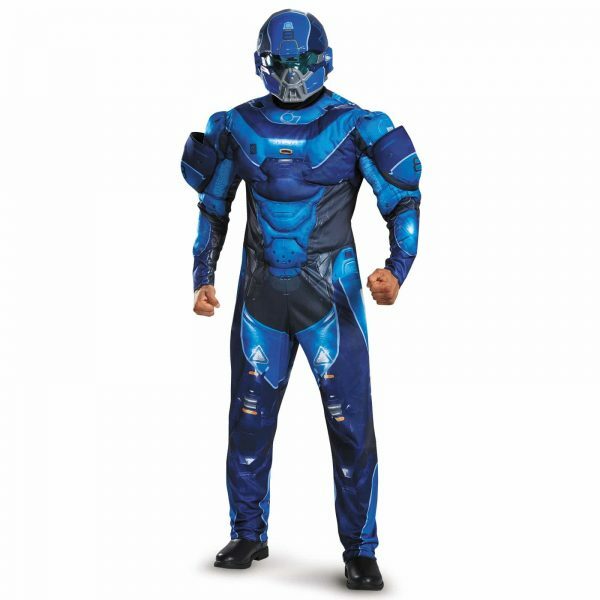 “Best children suit” category award goes to blue and red Spartan suits. We made this decision based on children’s nature and their love to be active and to have fun. We thought that this choice would be the most appropriate. 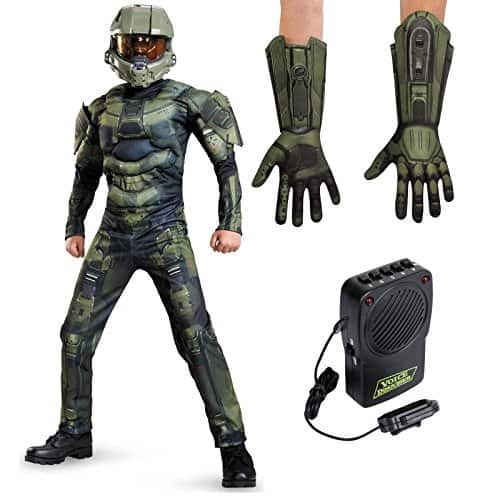 And if you are a parent with two children, we will suggest you buy yourself a nice new Halo Master Chief costume and your children will love already mentioned red and blue Spartan suits. Just imagine such a picture and we won’t need to explain this to you – it’s just a great idea! 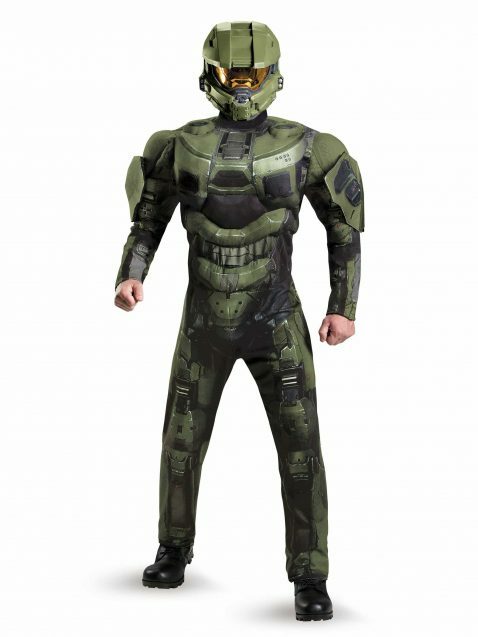 So here are the top muscle suits on the same topic of HALO universe. We hope that you’ve found this article useful. Good luck and have some fun during holidays!